Rendering of Lorain Ave when completed. 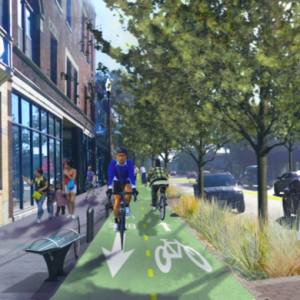 Progress towards Cleveland’s first truly protected bike lane was made last Friday when a packed room of supporters saw the conceptual plan for the Lorain Ave Protected Bike Lane unanimously approved by the Cleveland Planning Commission. The plan will see a two-way, protected bicycle facility run from West 20th Street roughly four miles to West 65th Street where the configuration of utility poles and the right of way changes such that it may be difficult to extend it all the way to 85th as originally hoped. Detroit Shoreway Community Development Organization still hope to make changes to the road west of 65th in an effort to make them more bicycle and pedestrian friendly, but those will come later. 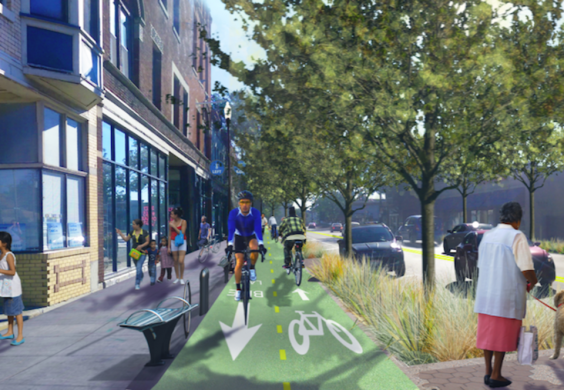 There is a lot of reason to be excited about the project, as it will play a large role in returning Lorain Ave to its more prosperous days when it was a true multi-modal corridor that accommodated more than just cars. In the presentation given by Tom McNair of Ohio City Inc. (the local CDC), he showed two images of Lorain Ave. One of yesteryear where people, transit, and cars were part of a bustling urban environment, and one of Lorain today, a relative desert, left vacant and abandoned by decades of shifting investment priorities driven by the car culture that shunted people and dollars away from our older urban centers in favor of suburbs. Protected bike lanes have been proven across the United States and the world to be great economic drivers, and one component of “place making” which aims to make our streets a destination again, not just a conduit for commuters heading through them. Retail improves, property values go up, crashes go down, and signal compliance (one of the major criticisms we hear about people on bikes) improves dramatically. This is exactly the kind of infrastructure we need to revitalize the corridor and attract residents to live and invest in our communities, and this will help Cleveland join cities who are building 21st century infrastructure. We applaud everyone involved, and the Cleveland Planning Commission for making such a wise decision that will positively impact our community for generations.